Jennifer L. Buur, DVM, PhD, DACVCP, associate professor of veterinary pharmacology at Western University of Health Sciences in Pomona, California, is currently involved in teaching evidence-based drug use to veterinary students. Dr. Buur received her DVM from University of Wisconsin-Madison, after which she worked in private practice, gaining clinical experience in small animal and exotic animal medicine, zoo medicine and wildlife rehabilitation, and shelter medicine. She also completed a PhD in comparative biomedical sciences (with a pharmacology emphasis) at North Carolina State University. Dr. Buur’s current research interests are curriculum validation and evidenced-based teaching methods. Chloramphenicol is a broad-spectrum, bacteriostatic anti-microbial agent that acts through the inhibition of protein synthesis via the 70S ribosome and its 50S ribosomal subunit. Anemia and other bone marrow suppression can occur secondary to mitochondrial damage at high doses or extended durations. Signs resolved after the drug was discontinued. Risk factors include a history of hepatic disease, neoplastic disease, polypharmacy, and exposure durations over 10 days. Humans are susceptible to developing anemia (dose-dependent and idiosyncratic aplastic forms) from inhibition of mitochondrial protein synthesis via the 70S ribosome. Because of highly variable changes in drug pharmacokinetics, therapeutic drug monitoring of chronic medications (eg, phenobarbital) is recommended midway through and after treatment with chloramphenicol. Chloramphenicol is metabolized by both phase I and phase II enzymes in the liver. Hepatic dysfunction can increase plasma concentrations and half-life, which can lead to an increased risk for adverse effects. 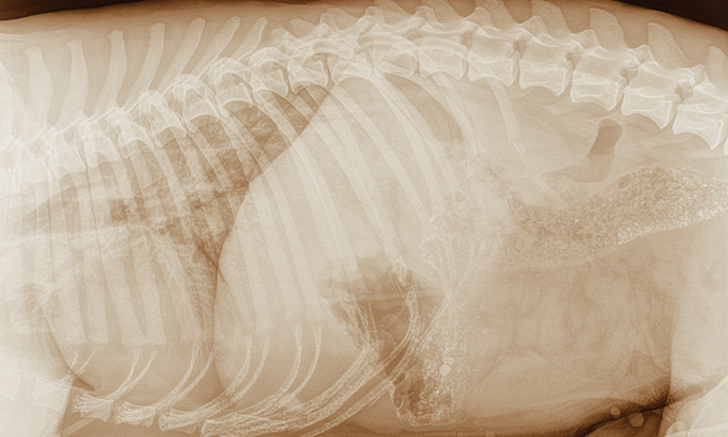 Because of the increased popularity of pot-bellied pigs as pets, veterinarians must recognize that all porcine species are considered under federal law as food animals. Dowling PM. Chloramphenicol, thiamphenicol, and florfenicol. In: Giguère S, Prescott JF, Baggot JD, Walker RD, Dowling PM, eds. Antimicrobial Therapy in Veterinary Medicine. 4th ed. Ames, IA: Blackwell Publishing; 2006:241-248. Short J, Zabel S, Cook C, Schmeitzel L. Adverse events associated with chloramphenicol use in dogs: a retrospective study (2007-2013). Vet Rec. 2014;175(21):537. Papich MG, Riviere JE. Chloramphenicol and derivatives, macrolides, lincosamides, and miscellaneous antimicrobials. In: Riviere JE, Papich MG, eds. Veterinary Pharmacology and Therapeutics. 9th ed. Ames, IA: Wiley-Blackwell; 2009:945-982. Li CH, Cheng YW, Liao PL, Yang YT, Kang JJ. Chloramphenicol causes mitochondrial stress, decreases ATP biosynthesis, induces matrix metalloproteinase-13 expression, and solid-tumor cell invasion. Toxicol Sci. 2010;116(1):140-150. KuKanich B, KuKanich K. Chloramphenicol significantly affects the pharmacokinetics of oral methadone in Greyhound dogs. Vet Anaesth Analg. 2015;42(6):597-607. Ciaccio PJ, Duignan DB, Halpert JR. Selective inactivation by chloramphenicol of the major phenobarbital-inducible isozyme of dog liver cytochrome P-450. Drug Metab Dispos. 1987;15(6):852-856. Houston DM, Cochrane SM, Conlon P. Phenobarbital toxicity in dogs concurrently treated with chloramphenicol. Can Vet J. 1989;30(7):598. Leite-Martins L, Mahú MI, Costa AL, et al. Prevalence of antimicrobial resistance in faecal enterococci from vet-visiting pets and assessment of risk factors. Vet Rec. 2015;176(26):674. Kelmer G, Tatz AJ, Famini S, Bdolah-Abram T, Soback S, Britzi M. Evaluation of regional limb perfusion with chloramphenicol using the saphenous or cephalic vein in standing horses. J Vet Pharmacol Ther. 2015;38(1):35-40. Animal Medicinal Drug Use Clarification Act of 1994, 21 USC §530 (1994). U.S. Government Publishing Office. Accessed at https://www.ecfr.gov/cgi-bin/text-idx?SID=054808d261de27898e02fb175b7c9ff9&node=21:6.0.1.1.16&rgn=div5#21:6.0.1.1.16.5.1.2. Updated October 1, 2017. Accessed October 4, 2017.